Austrian crystal earrings with green center stones and silver-tone rims. Titanium posts for pierced ears. You are viewing the earrings on a 2" x 2" card. 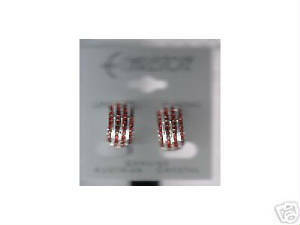 Austrian crystal earrings with Red or Green stones and silver-tone rims. Clip-on style.